Aragon ( or , Spanish and Aragonese: Aragón [aɾaˈɣon], Catalan: Aragó [əɾəˈɣo] or [aɾaˈɣo]) is an autonomous community in Spain, coextensive with the medieval Kingdom of Aragon. Located in northeastern Spain, the Aragonese autonomous community comprises three provinces (from north to south): Huesca, Zaragoza, and Teruel. Its capital is Zaragoza (also called Saragossa in English). The current Statute of Autonomy declares Aragon a nationality of Spain. Aragon's northern province of Huesca borders France and is positioned in the middle of the Pyrenees. Within Spain, the community is flanked by Catalonia to the east, Valencian Community and Castilla–La Mancha to the south, and Castile and León, La Rioja, and Navarre to the west. Covering an area of 47,719 km2 (18,424 sq mi), the region's terrain ranges diversely from permanent glaciers to verdant valleys, rich pasture lands and orchards, through to the arid steppe plains of the central lowlands. Aragon is home to many rivers—most notably, the river Ebro, Spain's largest river in volume, which runs west-east across the entire region through the province of Zaragoza. It is also home to the Aneto, the highest mountain in the Pyrenees. As of 2015, the population of Aragon was 1,317,847, with slightly more than half of it living in Zaragoza, its capital city. The economy of Aragon generates (as of 2014) a GDP of €33,162 million which represents 3.13% of Spain's national GDP, and is currently 6th in per capita production behind Madrid, Basque Country, Navarre, Catalonia and La Rioja. In addition to its three provinces, Aragon is subdivided into 33 comarcas or counties; all with a rich geopolitical and cultural history from its pre-Roman, Celtic and Roman days; and from the four centuries of Islamic period as Marca Superior of Al-Andalus or kingdom (or taifa) of Saraqustah, and as lands that once belonged to the Frankish Marca Hispanica; and counties that later formed the Kingdom of Aragon and eventually the empire or Crown of Aragon. As of 2015, half of Aragon's population, 50.45%, live in the capital city of Zaragoza. Huesca is the only other city in the region with a population greater than 50,000. The majority of Aragonese citizens, 71.8%, live in the province of Zaragoza; 17.1% in Huesca and 11.1% in Teruel. The population density of the region is the second lowest in Spain after Castilla-La Mancha: only 26,8/km². The most densely populated areas are around the valley of the river Ebro, particularly around Zaragoza, and in the Pyrenean foothills, while the areas with the fewest inhabitants tend to be those that are higher up in the Pyrenean mountains, and in most of the southern province of Teruеl. Only four cities have more than 20,000 inhabitants: Zaragoza 700,000; Huesca 50,000; Teruel 35,000 and Calatayud 20,000. Spanish is the native language in most of Aragon, and it is the only official language, understood and spoken by virtually everyone in the region. In addition to it, the Aragonese language continues to be spoken in several local varieties in the mountainous northern counties of the Pyrenees, particularly in western Ribagorza, Sobrarbe, Jacetania and Somontano; it is enjoying a resurgence of popularity as a tool for regional identity. In the easternmost areas of Aragon, along the border with Catalonia, varieties of the Catalan language are spoken, including the comarcas of eastern Ribagorza, La Litera, Bajo Cinca, Bajo Aragón-Caspe, Bajo Aragón and Matarraña. The strip-shaped Catalan-speaking area in Aragon is often called La Franja. With such a low population density large areas of Aragon remain wild and relatively untouched. It is a land of extreme natural contrasts, both in climate and geologically, from the green valleys and snow-capped peaks of the Pyrenees to the dry plains and lonely hilly areas of the south. Aragon's Pyrenees include splendid and varied mountain landscapes with soaring peaks, deep canyons, dense forests and spectacular waterfalls. Its rugged peaks include the Aneto (3,404 m), the highest in the range, the misty Monte Perdido (3,355 m), Perdiguero (3,221 m), Cotiella (2,912 m) and many others. Ordesa y Monte Perdido National Park, near the border with France, boasts some of the most spectacular scenery in Europe with its canyons, frozen lake caverns, numerous waterfalls and varied wildlife many species of which are endemic to the Pyrenees. The park is also one of the last sanctuaries of birds of prey in the range. Many beautiful mountain butterflies and flowers can be seen in the summer, while during winter the region is a paradise for skiers. The principal valleys in the mountains include those of Hecho, Canfranc, Tena, Benasque and others. 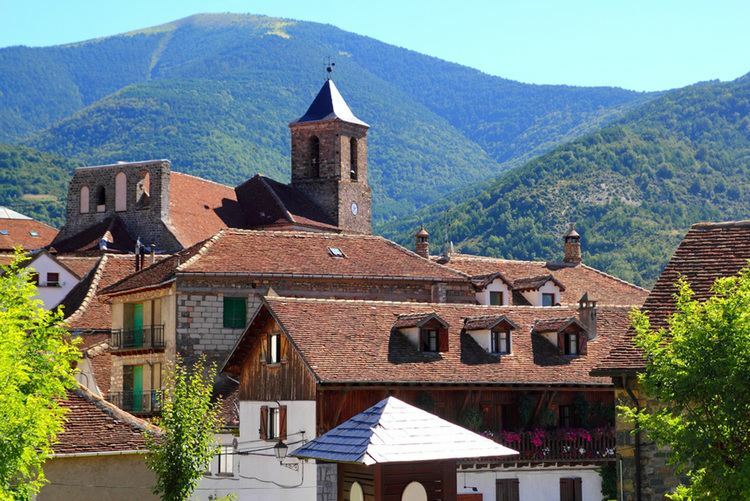 The green valleys hide pretty villages with nice Romanesque churches and typical Pyrenean houses with flowers on the balconies. The oldest Romanesque cathedral in Spain is located in the medieval town of Jaca in the very northern part of Huesca Province. In the Pyrenean foothills, or pre-Pyrenees, the Mallos de Riglos are a famous natural rock formation. Ancient castles nestle on lonely hills, the most famous being the magnificent Loarre Castle. Further south, the Ebro valley, irrigated by the river Ebro, is a rich and fertile agricultural area covered with vast fields of wheat, barley and other fruit and vegetable crops. Many beautiful and little-known settlements, castles and Roman ruins dot the landscape here. Some of the most notable towns here include Calatayud, Daroca, Sos del Rey Catolico, Caspe and others. South of Zaragoza and the Ebro valley, the elevation rises again into the Sistema Ibérico, a complex system of mountain ranges that separates the Ebro valley from the Meseta Central and plains of Castilla–La Mancha. The highest massif in this range is the Moncayo (2,313 m) and, despite getting less snow than in the Pyrenees, it has several ski resorts. Aragon's climate can be defined as continental moderate. Temperatures are determined mainly by altitude, ranging from cold or very cold in winter and cool in summer in the mountains to the north (Pyrenees) and to the south and west (Iberian range), to mild in winter and hot in summer in the central lowlands. Rainfall is also very variable, with very low mean values in the central areas and increasingly higher values in mountain areas, especially in the high Pyrenees. In the middle of Aragon, which is only 200 metres (660 ft) above sea level, the annual average temperature is around 14 °C (57 °F). To the north and south of the Ebro valley, where the elevation rises to 500 m (1,600 ft) above sea level, the temperature drops by two degrees. In the mountains, between 600 m (2,000 ft) and 1,000 m (3,300 ft) observed temperatures are between 11 and 12 °C (52 and 54 °F). The cierzo wind is very common in the central area of Aragon, around the Ebro valley, during the autumn and winter. Aragon is divided into three provinces from north to south, named after their capitals: Huesca, Zaragoza and Teruel. The provinces are further divided into 33 comarcas, three of which are in more than one province. There are a total of 732 municipalities in the region. Aragon is named after the Aragón river, a tributary of the Ebro. Before Aragon came into being as a self-proclaimed kingdom in 1035, the northern counties of Jaca, Sobrarbe and Ribagorza were all counties and appanages suzerain to the Kingdom of Navarre. King Sancho set out on his will the primacy of Pamplona over all appanages (domains for the personal management of his offspring) including Castile, but his younger children set off on separate paths instead, establishing their own kingdoms. Ramiro I was for the first time named king of Aragon in 1035. Later, after his brother Gonzalo's death, he was also named king of Sobrarbe and Ribagorza in 1044. The new kingdom grew quickly, conquering territories from the Moorish kingdoms to the south. Huesca was taken in 1096 and Zaragoza in 1118. According to Aragonese law, the monarch had to swear allegiance to the Kingdom's laws before being accepted as king. Like other Pyrenean and Basque realms (and unlike Castile), the Aragonese justice and decision making system was based on Pyrenean consuetudinary law, the King was considered primus inter pares ('first among equals') within the nobility. A nobleman with the title "Justicia" acted as ombudsman and was responsible for ensuring that the King obeyed the Aragonese laws. An old saying goes, "en Aragón antes de Rey hubo Ley" ("in Aragon Law came before King"), similar to the saying in Navarre, "antes fueron Leyes que Reyes", with much the same meaning. The dynastic union in 1137 between Petronila, Queen of Aragon, and Ramon Berenguer IV, Count of Barcelona, produced a son, Alfonso II of Aragon who inherited all their respective territories creating the Crown of Aragon which included all lands and people, titles and states previously outside of the Kingdom of Aragon. The Crown of Aragon was effectively abolished after the dynastic union with Castile (1469, see below) but the title continued to be used until 1714. The dynasty of the Kings of Aragon ruled the present administrative region of Aragon, Catalonia, and later the Balearic Islands, Valencia, Sicily, Naples and Sardinia (see Aragonese Empire). The monarch was known as King of Aragon and also held the titles of King of Valencia, King of Majorca (for a time), Count of Barcelona, Lord of Montpellier, and (temporarily) Duke of Athens and Neopatria. Each of these titles gave him sovereignty over the specific region, and the titles changed as territories were lost and won. Despite the dynastic union with Castile following the marriage of Isabella I of Castile and Ferdinand II of Aragon at the end of the 15th century following which most former kingdoms in Spain were progressively consolidated during the 16th and 17th centuries, Aragon lasted as a separate kingdom with its own laws and institutions until 1707 when Philip V, the first Bourbon king of Spain, invaded Aragon with his army and forced the signature of the Nueva Planta decrees, making Spain into a more centralized state and forcing the use of Castilian language. During the War of the Spanish Succession the advancing army of German, British and Dutch troops defeated the Spanish Army in the battle of Saragossa in 1710. As a result of the battle Philip V was forced to abandon Madrid, retreating to Valladolid. During the Spanish Civil War, Aragon saw the establishment of various anarchist communes. The particularly harsh winter of 1937 to 1938 saw the Battle of Teruel, one of the most bloody of the war, which ended in a Nationalist victory. In 1982 Aragon became an autonomous community within the new Spanish democratic state. In Summer 2008, the international exposition of Expo 2008 was held in Zaragoza. The current Coat of arms of Aragon was first documented in 1499. Its fourth quarter, the Coat of arms of the Crown of Aragon, features on the Coat of Arms of Spain, as well as the flags and heraldry of several territories in Spain and abroad which were ruled by the Crown of Aragon, such as Catalonia, the Balearic Islands and Languedoc-Roussillon. The flag of modern Aragon, adopted in 1983, has the arms over the Crown arms. The official Aragonese anthem is the Himno de Aragón, with music composed by the Aragonese Antón García Abril and lyrics by various poets of the region. It is sung in Spanish with no official translation into Aragonese or Catalan. Aragon Day (Spanish: Día de Aragón, Aragonese: Día Nacional d'Aragón, Catalan: Diada Nacional d'Aragó) is celebrated on 23 April, St George's Day, the patron of Aragon since the 15th century. The flag is made in flowers in the Plaza de Aragón in the capital, Zaragoza. Some medieval monuments of Teruel and Zaragoza are protected by UNESCO as part of the World Heritage Sites Mudéjar Architecture of Aragon. The traditional dance of Aragon is known as jota and is one of the faster Spanish dances. It is also the most widespread in Aragon and the exact style and music depend on the area. There are other less popular dances named "paloteaos" similar to the sword/stick dances of other regions. The music to one local dance, "The Dance of Majordomos" of Benasque, was so enjoyed by Rafael del Riego on a visit to the town that he ordered it to be copied resulting in the "Hymn of Riego" . Typical Aragonese instruments include the stringed drum or "Chicotén", bagpipes such as the "gaita de boto", oboes such as the "Dulzaina", and small flutes like the "Chiflo". Some instruments have been lost, such as the "trompa de Ribagorza", although there have been efforts to reconstruct them. In contrast to other Pyrenean regions, the "Chicotén" and "Chiflo" never have stopped being played. The Carnival of Bielsa (Huesca) has ancient origins and includes a group of men carrying long sticks, wearing skirts, cowbells and boucard/goat-like horns and skins with black-painted faces called "Trangas" symbolising "virility" who surround another man wearing skins playing the part of a bear called "l'onso". In Aragonese mythology the bear carried souls between the world of the living and the world of the dead. Trangas dance with young females named "madamas" symbolising "purity" and wearing colourful dresses. Other traditional figures include a horse rider named "Caballé". With its lush Pyrenean pastures, lamb, beef, and dairy products are, not surprisingly, predominant in Aragonese cuisine. Also of note is its ham from Teruel; olive oil from Empeltre and Arbequina; longaniza from Graus; rainbow trout and salmon, boar, truffles and wild mushrooms from the upper river valleys of the Jacetania, Gallego, Sobrarbe, and Ribagorza regions; and wines from Cariñena, Somontano, Calatayud, and Campo de Borja; and fruit, especially peaches, from its fertile lower valleys. The region also features a unique local haggis, known as chireta, several interesting seafood dishes, including various crab pastes, which developed from an old superstition that crabs help prevent illness, and sweets such as "Adoquines del Pilar" and "Frutas de Aragón". There are also other sweets like "Tortas de alma" from Teruel and "Trenza de Almudevar" or "Castañas de Huesca" from Huesca. Aragon is among the richest autonomous regions in Spain, with GDP per capita above the nation's average. The traditional agriculture-based economy from the mid-20th century has been greatly transformed in the past several decades and now service and industrial sectors are the backbone of the economy in the region. The well-developed irrigation system around the Ebro has greatly supported the productive agriculture. The most important crops include wheat, barley, rye, fruit and grapes. Livestock-breeding is essential especially in the northern areas, where the lush meadows provide excellent conditions for sheep and cattle. The main livestock are cattle, 334,600; sheep, 2,862,100; pigs, 3,670,000; goats, 78,000; and poultry, 20,545,000. The chief industrial centre is the capital Zaragoza, where the largest factories are located. The largest plant is the Opel automotive plant with 8,730 employees and production of 200,000 per year. It supports many related industries in the area. Other large plants in the city include factories for trains and household appliances. Mining of iron ore and coal is developed to the south, near Ojos Negros. Electricity production is concentrated to the north where numerous hydro power plants are located along the Pyrenean rivers and in the 1,150 MW Teruel Power Plant. There is an aluminium refinery in the town of Sabiñánigo. The main centres of electronics industry are Zaragoza, Huesca and Benabarre. Chemical industry is developed in Zaragoza, Sabiñánigo, Monzón, Teruel, Ojos Negros, Fraga, Benabarre and others. The transport infrastructure has been greatly improved. There are more than 1,000 km (620 mi) of motorways which run from Zaragoza to Madrid, Teruel, Basque country, Huesca and Barcelona. The condition of the other roads is also good. As of 2005 there are 520,000 cars in Aragon. Through the territory of the province runs the new high-speed railway between Madrid and Barcelona with siding from Zaragoza to Huesca, which is going to be continued to the French border. There is an International Airport at Zaragoza, as well as several smaller airports at Huesca, Caudé, Santa Cilia de Jaca and Villanueva de Gállego. As an autonomous community of Spain, Aragon has an elected regional parliament (Spanish: Cortes de Aragón, Aragonese: Cortz d'Aragón, Catalan: Corts d'Aragó) with 67 seats. It meets in the Aljafería, a Moorish palace in the capital city, Zaragoza. The Parliament chooses a President for the Diputación General de Aragón or Aragon Government, for a four-year term. The current president (since July 2015) is Javier Lambán of the PSOE. Nationally, Aragon elects 13 Deputies and 14 Senators to the Cortes Generales. In addition to the Spanish-based political parties, there are a number of Aragón-based parties, such as the Chunta Aragonesista, a left-wing Aragonese nationalist party, and the Aragonese Party, more conservative. Chunta Aragonesista had a seat in Spain's national Congress of Deputies from 2000 to 2008, while the centrist Aragonese Party has three national senators, who are in coalition with the ruling People's Party. In a 2011 regional government survey, 47.6% of the population wanted greater autonomy for Aragon, while 35.2% were satisfied with its current level of autonomy. A total of 6% wanted an end to autonomy and 3.2% wanted full independence. Aragon in the Middle Ages was the hub of the wider Crown of Aragon. The Crown was represented in the region from 1517 by a viceroy. In 1479, King Ferdinand II of Aragon married Isabella I of Castile, a kingdom covering much of the rest of modern Spain. However, until the Nueva Planta decrees of 1707, Aragon maintained its own separate laws and institutions. Aragon has media set-ups in television, radio and numerous newspapers. On April 21, 2006, regional television broadcasts in Aragon officially began with the launch of Aragón TV. The law which established the CARTV (Aragon Corporation Radio and Television) dated from 1987, but various political disputes delayed the project for several legislatures. During the years that Aragon had no public television, several media groups sought to supplement their absence. For one TVE-Aragon, taking the Territorial Centre in Zaragoza, produced several programs and educational activities with the Aragonese town. As for private groups, there were several projects. The most widely accepted for many years had been Antena Aragón, which came to be regarded as regional television. This channel was created in 1998 and disappeared in 2005 shortly after having to leave the Media Production Center (CPA), as this was built by the DGA for future public television host Aragon. With the push for the creation of public television, Antena Aragón merged with RTVA (Radio Television Aragonesa) belonging to the Herald Group. Merging RTVA Antena Aragón and led to channel ZTV (Zaragoza Television). Moreover, Antena 3 Televisión aired for several years, and off to Aragon, a news report fully Aragonese, having a central issue in the Pinares de Venecia in Zaragoza, within the premises of the Theme Park of Zaragoza . Aragón TV was launched in 2006 after spending a season broadcasting a letter and a loop with images of Aragonese villages and audio of regional radio programs. Aragon Radio, began broadcasting on 18 August 2005 at 5PM with the sound of drums and drums of Calanda and a group song Zaragoza "The Fish". Estimates of its audience range from 20,000 listeners, according to the latest EMG, to 70,000, according to private findings. The channel has regional news bulletins every hour from 7AM to midnight and coverage of sports. Aragon's most successful football (soccer) club is Real Zaragoza. The club was founded in 1932 and has played at its current ground, La Romareda, since 1957. Real Zaragoza have won six Copa del Rey titles from 1964 to 2004, and the 1995 European Cup Winners' Cup. Smaller clubs in the region include CD Teruel and SD Huesca. Skiing is popular in the Pyrenean north of Aragon, at resorts such as Formigal and Candanchú. The Aragonese city of Jaca in the Pyrennes bid to host the Winter Olympics from 2002 to 2014. Zaragoza was considering a bid for the 2022 Winter Olympics, but dropped it in 2011 to strengthen the chance of Barcelona winning the games. The Ciudad del Motor de Aragón, also known as Motorland Aragón, is a motorsport race track located near Alcañiz in Aragon. It is home to the Aragon motorcycle Grand Prix. Saint Elizabeth of Portugal (1271–1336) was queen consort of Portugal and a saint of the Roman Catholic Church. Antipope Benedict XIII (1328–1423) known as Papa Luna was an Avignon pope and art patron-sponsor. King Ferdinand II of Aragon (1452 - 1516) married queen Isabella I of Castile and united the Kingdom of Aragon with the kingdom of Castile, giving form to the actual Spain. Michael Servetus (1509/11 - 1552) was a theologian and physician who received numerous charges of heresy by both Catholics and Protestants and was burnt at the stake in Calvin's Geneva during the 16th century. Joseph Calasanz (1557–1648) was a Catholic priest who dedicated himself to the education of poor boys at Rome and founded a society pledged to that work. Baltasar Gracián (1601 - 1658) writer of Spanish Baroque literature. Gaspar Sanz (1640–1710), composer, guitarist and organist. Rocque Joaquin de Alcubierre (1702-1780) was a military engineer who discovered the ruins of Pompeii. Francisco Garcés (1738–1781) was a missionary priest to North America who founded two pueblo missions. Francisco de Goya (1746–1828) 18th-century painter. Eva Amaral, Singer-songwriter and member of the Rock band Amaral. Enrique Bunbury (Enrique Ortiz de Landázuri), is a Spanish rock singer-songwriter for Heroes del Silencio and Enrique Bunbury Band. St. Josemaría Escrivá, Spanish Catholic priest, founder of Opus Dei. Pablo Gargallo, sculptor and painter. José Antonio Labordeta, singer, writer and politician. Santiago Ramón y Cajal, Nobel Prize in Physiology or Medicine for his research on the human brain and nervous system.